The hypertrophic Lake Zwemlust, a small water body used as a swimming pool, was characterized by algal blooms in summer, reducing the Secchi disk transparency to less than 0.3 m. Since in The Netherlands a Secchi disk transparency of ≥1 m is obligatory for swimming waters, corrective measures were called for to improve the light climate of the lake. In March, 1987, as an experiment, the lake was drained by pumping out the water to facilitate fish elimination. Planktivorous and benthivorous fish species, which were predominant, were removed by seine- and electro-fishing. After the lake had refilled by seepage it was restocked by a new simple fish community comprising pike (Esox lucius) and rudd (Scardinius erythrophthalmus) only. Stacks of willow twigs (Salix) and macrophytes (roots ofNuphar lutea and ‘seedlings’ ofChara globularis) were introduced into the lake as spawning grounds and refuges for the pike against cannibalism and as shelter for the zooplankton. The effects of this food web manipulation on the light climate, phytoplankton, zooplankton, fish, macrophytes, macrofauna and on the nutrient concentrations were monitored during 1987 and 1988. In summer 1987, despite of high nutrient concentrations, the phytoplankton density was low, due to control by zooplankton, causing a Secchi disk transparency of ≥2.5 m, the maximum depth. Chlorophyll-a concentrations were low (<5 μg Chl.l−1), blooms of cyanobacteria did not occur and a shift from rotifers to cladocerans took place. In 1988, however, also some negative effects were noticed. 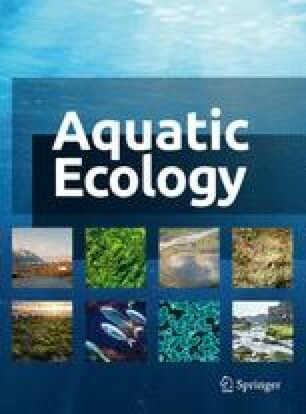 Macrophytes and filamentous green algae reached a much higher biomass (50–60% cover of the lake bottom) than in 1987; some species, growing through the entire water column, interfered with the lake's recreational use. Associated with the macro-vegetation and possibly with the absence of larger cyprinids, the diet of which also comprises snails, a large scale development of the snail population, among themLymnaea peregra var.ovata took place. This species is known to act as an intermediate host of the bird-parasitizing trematodeTrichobilharzia ocellata, the cercariae of which cause an itching sensation at the spot of penetration of the human skin, accompanied by rash (schistosome dermatitis or swimmers' itch); in July, 1988, about 40% of the bathers complained about this itching. A positive effect of the macrophytes and filamentous green algae was the high uptake of nitrogen, resulting in a low nitrogen concentration in the lake and growth limitation of the phytoplankton population by nitrogen in the summer of 1988. In 1988 the cladocerans were abundant in April only; and unlike in 1987, in the summer of 1988 there was a shift from cladocerans to rotifers. Therefore, only in early spring (April) zooplankton grazing controlled phytoplankton growth and in summer nitrogen limitation was the major controlling factor, keeping chlorophyll-a concentrations low.